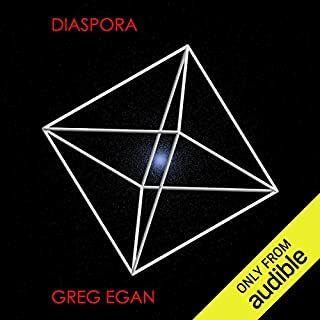 "Diaspora" by Greg Egan (1997) is of mixed quality. The novel was written to fit around a short story that Egan published earlier, "Wang's Carpets." That short story appears as Chapter 11. From the start of the book through the end of Chapter 6 (Parts 1 and 2), Diaspora offers some of the best science fiction I've listened to. It is chock full of fascinating ideas, the plot is engaging and exciting, and you care deeply about the characters. Chapter 11, "Wang's Carpets," is another bright, high point in the audiobook. Unfortunately, these high-quality sections only make up about a third of the novel. The remaining chapters are of much lower quality, and that quality gradually diminishes further as the end of the novel approaches. The important characters become less and less relateable, and Egan spends too much time philosophizing over fictional mathematics and physics. The last third of the book is a wild goose chase, whose ultimate conclusion is deeply unsatisfying and more than faintly ridiculous. I was left feeling cheated, as though Egan demonstrated his tremendous ideas and ability, then strung me along, promising more and failing to deliver. It is difficult to assign a star rating to a book with both excellent and disappointing segments. I ultimately decided to award four stars, which I consider a generous rating for a book that was one-third excellent, one-third mediocre, and one-third poor. While some reviewers complained about the narrator, I found nothing wrong with Adam Epstein's narration. It seemed perfectly normal and acceptable to me, and I found his use of voices to distinguish different characters helpful (and similar to what other audiobook narrators do). If you wish to experience the good parts of Diaspora, you are in luck: Parts 1 and 2 (chapters 1 through 6) stand on their own as a self-contained story. You can listen to these chapters and then stop. Or, if you prefer, you can read from chapter 1 through chapter 11, which will cover all of the book's high points while avoiding the worst parts, which come near the end. If you proceed all the way through, you will find that nuggets of value become increasingly scarce, lost in a seemingly five-dimensional scape of bland text. If you are interested in Diaspora, consider "Blindsight" by Peter Watts, a story that has a similar style but is strong from beginning to end.